AirClean® Systems, the North American leader in ductless containment since 1992, announces the introduction of its newest product line: Endeavour™ Ductless Fume Hoods. Endeavour™ ductless hoods incorporate much of the advanced technology of AirClean® Systems’ Independence fume hood with the cost effective backbone of AirClean® Systens’ AC4000 folding and sliding-sash ductless fume hoods. Endeavour™ ductless fume hoods feature the easy-to-use AirSafe™ NXT automatic safety controller for added operator safety. This color touchscreen controller automatically increases or decreases blower speed to maintain the user’s pre-set face velocity, ensuring airflow is within standard operating parameters. The current face velocity is displayed at all times. AirSafe™ NXT also monitors the bonded carbon filtration bed, alerting the user audibly and visually should filter saturation occur. Patriot™ features a unique application confirmation sequence that is required with every use of the hood. AirSafe™ NXT displays the approved chemical class for the hood and waits for a confirmation from the user before allowing the hood to be used. In addition to safety features, AirSafe™ NXT also provides a multi-language and multi-unit capability not found in most ductless hoods. With the press of a button, users can switch the controller language between English, Spanish, French and German. Airflow can be displayed in both linear feet per minute (LFM) and meters per second (m/s). Endeavour™ ductless hoods eliminate the need for costly installation, ductwork and over-built HVAC systems associated with traditional fume hood use within the laboratory. An on-board energy meter, accessed via AirSafe™ NXT, displays the real-time and life-time energy use of the hood. Endeavour™’s rolled-entry design combined with AirZone™ baffling provides laminar flow within the cabinet, preventing eddy currents and keeping fumes or particulate from escaping the hood. Seamless, thermally welded polypropylene construction means the Endeavour™ will never rust, providing years of service life. All electronics and blowers are post-filter, so they are never exposed to chemicals used in the hood. 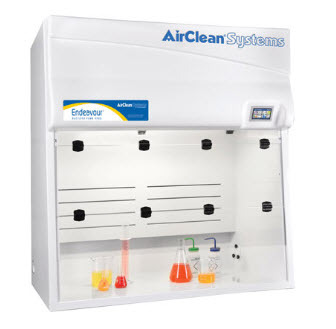 All AirClean® Systems ductless fume hoods are made in the USA and ship fully assembled, requiring minimal installation. Simply place on a cabinet, stand or bench top and plug into a standard 110V or 220V outlet. The Endeavour™ ductless fume hood can be installed and used within minutes of being removed from its shipping container. Endeavour™ ductless fume hoods are now available. Folding sash and sliding sash models are initially available in 48” and 72” widths.